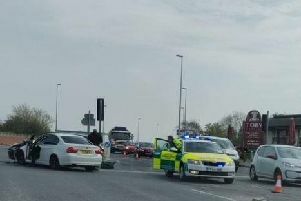 Police were called to junction 9 (Walton Summit) shortly before 11am yesterday (Sunday, April 14) after a Mercedes C220 collided with the rear of a VW Passat, shunting it off the carriageway and into a tree. Police were called shortly before 11am on Sunday, April 14 after a Mercedes C220 collided with the rear of a VW Passat, shunting it off the M61 carriageway and into a tree. The driver of the Passat, a 38-year -old man from Hull, suffered serious injuries and was taken by ambulance to Royal Preston Hospital where he remains in a serious condition. Three passengers in the Passat, a man and two women also from Hull, suffered more minor injuries. The driver of the Mercedes, a 27-year-old man from Blackpool, was arrested on suspicion of drug driving, causing serious injury by dangerous driving and having no insurance. The motorway was closed for about five hours as accident investigators attended the scene, before reopening around 5pm. Lancashire Police are now appealing for witnesses to the crash. Sgt Martin Wilcock, of Tac Ops, said: “This collision has left a man with some very serious injuries and I would appeal to anyone who witnessed the collision itself, or the Mercedes in the moments beforehand, to get in touch. Fire crews had to cut the 38-year-old driver out of the overturned Passat (pictured) before he was handed over to paramedics for emergency treatment. 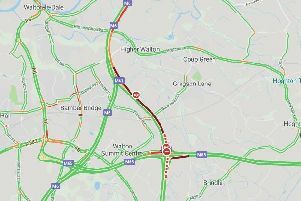 A spokesman for Lancashire Fire and Rescue Service said: "Fire crews from Preston and Bamber Bridge were called to a road traffic collision on the M61 motorway, near to junction 30 of the M6 Southbound and junction 9 of the M61. "The incident involved one car which had left the roadway. "Firefighters rescued one person from the vehicle using holmatro cutting gear and pyrotechnics equipment. "They were in attendance approximately one and a half hours." Anyone with information should contact police on 101 quoting log number 0439 of Sunday, April 14.